Some time ago Jeya mentioned that it is still possible to visit a bucket dredge some 10Km from Batu Gajah on the Tanjung Tualang Road. This is dredge number TT5 and it is open to visitors for a small entrance fee. You may walk on the dredge to get a feel for its massive size (4,500 tonnes weight) and talk to the man behind the project Steven Ng who seems to spend most of his life there. 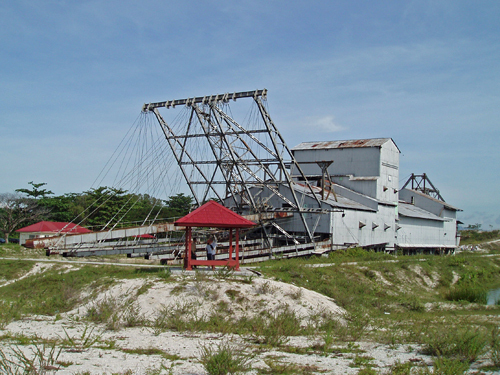 This dredge, a museum piece, the last in Perak and one of only 3 left in Malaysia was built in 1938 by W F Payne & Sons and worked the mining pools in the Kinta vally for 44 years. It stopped working in 1983 when the price of tin dropped to a level where it was no longer an economic proposition. Today it sits in a man-made pond at Desa Perlombongan along the Tanjong Tualong Road and is well signposted. Unfortunately the machinery no longer runs, but if you want to get an idea about how the dredge worked, click here and you will find the 11 different operations that took place on a dredge of this sort. I want to bring a group of people (youth mostly) to the dredge for a visit. Dont know who to contact. Can you help? The dredge is managed by Dato’ Rahman and Steven Ng. The office number in Ipoh is 05 546 5229. You should be able to make arrangements through them.